Organists will be unable to resist this abridged transcription of Strauss’s magnificent essay for symphonic brass. Robert Gower masterfully renders for a solo performer the rich harmonies and challenging cross-rhythms of the original score. 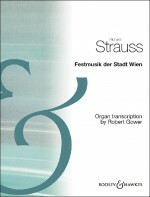 Moreover, he offers a versatile reading playable on instruments both large and small: optional registration indications for a two-manual organ seek to reflect the antiphonal possibilities of the two brass choirs envisaged by Strauss. But with this piece the larger the instrument, the greater the potential for sonic spectacular!